Watching sports is no longer restricted to television sets. Thanks to free sports streaming sites, enthusiasts and fanatics all over the world have a wealth of options to watch sports online. There are plenty of live sports streaming websites and services that allow them to catch their favorite sports and teams in action wherever they are and, most important, for free. While paid streaming services have their benefits, free live sports streaming websites have the no-cost tag as their unique selling point. As for any free online contents, these websites to watch sports online can come with some limitations. Geo-restriction is usually the first roadblock you must bypass, but there is something else that should concern you more. Many free live sports streaming sites may link to illegal resources. Therefore, it is always advisable to activate a VPN for streaming before connecting to these free live sports websites. As we are about to explain, a VPN is necessary to bypass the geo-restriction and protect yourself from legal problems. First of all, let’s see what are the best websites to watch free live sports events online. The websites on the list are active (at least at the time when this article was written!) and have been selected for the selection and quantity of live streaming content offered. They have not been arranged in any particular order. 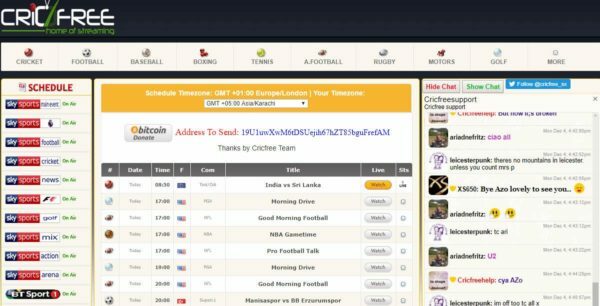 When it comes to free sports streaming sites and ensuring that users get the best possible experience, there’s no website better than cricfree.org. The interface of the website makes it really attractive especially for baseball, American football, and golf enthusiasts. There is a schedule on the show which gives you information on upcoming matches. The links are well updated and are always working. Ads are present, but not many of them, and they aren’t as obtrusive and in-your-face as you find on other websites. You can read our article on how to use Cricfree avoiding legal problems. Myp2p has gone from a blogging space to an entertainment space. If you are a football or cricket fanatic, you will find literally every single match stream on Myp2p. That does not mean that other sports do not have due coverage. Whatever sport you want to watch, you can get it on this website. The links are updated every five minutes to ensure all of them are working and not dead. The only problem with this website is that you have to search a little for alternative matches. This website gives you access to live streaming for Football, Basketball, Baseball, American Football, Ice hockey and a lot more. 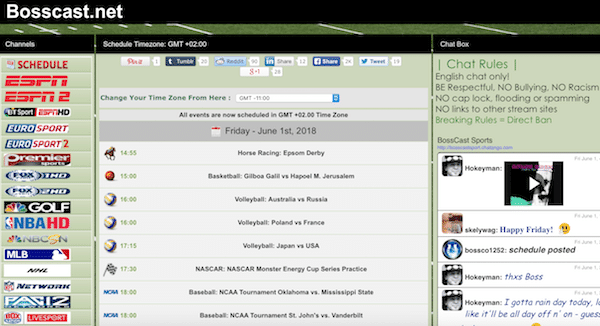 Once you connect to ReadStream.tv, you can see on the home page all the live sports streaming events that are currently broadcasted. Alternatively, in the top menu, there are the links to specific sports so you can check either what is live or upcoming sports events. 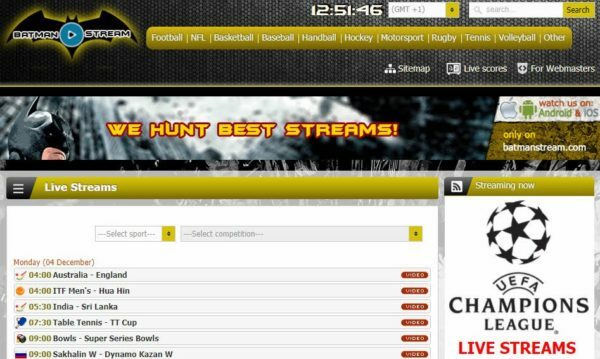 When it comes to best free sports streaming websites, Batmanstream.net has to be a part of the list. You will usually find it among the top names since it is the service that gets the maximum number of users on a regular basis. This is because Batmanstream helps you watch any sport you want. All sports are neatly categorized, and you can search for them from the home page. You can search for specific competitions or leagues, which is a great plus point for football fans all over the world. While some mirror links are not available for users in restricted countries, there isn’t anything else that will cause you to think twice about going to this website the next time you want to catch live action from your favorite sport. The name of this website can mislead you into thinking that this platform focuses on live streaming Cricket events. This is not the case at all! On CricHD you can find an impressive quantity of live events for any sports, including Cricket of course. 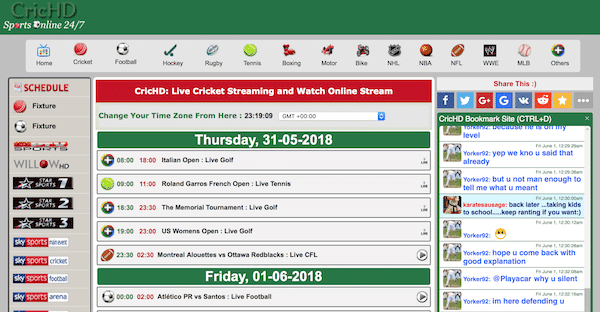 Moreover, what we like about CricHD is the fact that they broadcast 24/7 live content from major cable TVs like SkySports, BTSport, EuroSport, ESPN, FoxHD, BBC and many more. There is no need to say that the live streaming content you find here is not legal, therefore always activate your VPN before using CricHD. Stream2Watch.live is popular among live sports streaming sites since it focuses mainly on Basketball, Baseball, Hockey, Soccer, Football, and Tennis. The website claim to be legal but this is quite controversial. Given the quantity of live streaming content available on this platform, it is difficult to believe that its content is 100% legal. However, Stream2Watch offers high-quality HD live sports streaming you can access for free. Ads are quite invasive, but this is the price to pay for most free live streaming websites. 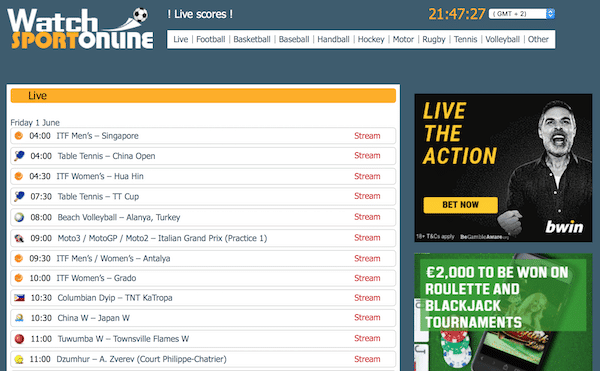 This is arguably the best free sports streaming site in Europe and one of the best worldwide. Livetv.sx has the most attractive UI and is still one of the easiest to navigate websites. All your sports are properly categorized. The primary focus is on European sports and events, which is why you will find sports and events you won’t usually find on other streaming websites. Since the website is designed primarily for the European audience, there is lesser space and focus on American football and NFL, which is the reason for US citizens making up for just 10% of the traffic. UK nationals are also reported to encounter problems while trying to access the website. However, the website supports five different languages, has a great UI, and announces streams for events days in advance. Fromhot.com is a platform where you can find access to almost any sports event. Doesn’t matter what is your favorite sports, you will likely find it on fromHot.com. The website has a clean look, and it is effortless to navigate. On the homepage, you can see a list of current live streaming events and upcoming ones. To use fromHot.com you do not need to register. Vipbox.nu is a website that has been around for more than five years. The only way free sports streaming sites continue to stay active that long and attract new visitors every month is by providing active stream links for all major sports. They support 7 different languages and host links for sports and events from all over the world. The best part about using Vipbox.nu is that you can search for a particular match in the search bar and get information about it in a single go. The website design and maximum uptime make it a website worth a visit. MLB fans might not find it as attractive, though. Also, the URL of this website changes quite often, so it is a little difficult to keep track of it. Watchsportonline.cc offers only HD content, which is something we like a lot. The website is easy to navigate since the interface is very intuitive. On the top bar, you find the “Live” button that gives you direct access to any live events available at any given time. Alternatively, you can search your favorite sport to find the event you are looking for. 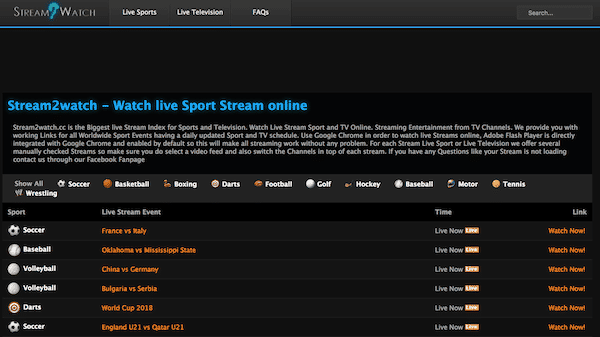 WatchSportOnline gives you access to HD live streaming for practically any kind of sports. Before watching HD live sports streaming, you need to sign up to the platform. Bosscast.net is a platform somewhat different than the other ones. Even though it offers the same quantity of live sports streaming events, the website doesn’t feature a menu where you can navigate to your favorite sports section. On the homepage, you can see the list of current live and forthcoming sports events. On the sidebar, there are even the links to major cable TVs like ESPN, EuroSport, FoxHD, TSN, NBA HD, and many more. Of course, the live content is not legal and the website is known for installing malware on your device. Therefore, always have you VPN active and good and updated antivirus. 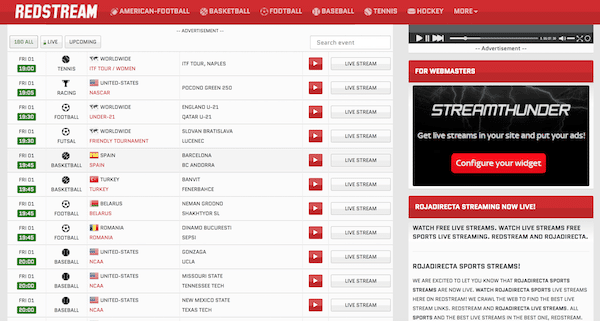 As you can see from the list of websites we prepared, watching free live sports streaming events is not difficult. All you need to do is to navigate to one of the websites on this list and look for the sports event. You must be aware that many of these free sport streaming sites may bombard you with tons of advertisement. As annoying as it may be, it is a fair price to pay to have free access to any live sports event you may wish. However, what you must understand is that all these resources might likely redirect you to illegal online contents. Copyright infringement is a serious offense, and you may get into legal problems if caught. Many governments, ISP, and copyright holders are intensifying controls to prevent users from accessing illegal live streaming contents or any other material protected by copyright. Therefore, you must be aware that using these websites to watch sports events online is most of the time an illegal practice. If you decide to go ahead anyhow, always use a reliable and efficient VPN service. While free live sports streaming sites allow users to watch their favorite sports for free, there is often a restriction user are unable to overcome. That restriction is geo-blocking, which means that a lot of the best free sports streaming websites are not available in some countries. Since people do not always develop a liking for a sport or a team based on their location, this can be a hindrance. Moreover, if you live abroad as an expat or traveling to another country just for work or vacation, watching your favorite sports online may be impossible. This problem can be solved easily through a VPN service. A VPN hides your real location by masking your IP address with that of the VPN server. When you use a VPN, the IP address and location that appears to anyone is that of the VPN server you are connected to. Therefore, all you have to do is to connect to a VPN server located in the country of the sports streaming site that broadcast the live sports event and you will appear like connecting from that very country. This simple trick grants you access to live sports streaming websites to watch your favorite sports from anywhere in the world. You should understand, though, that since VPNs encrypt your connection, an Internet speed reduction is common. This is why you should choose one of the best VPNs for streaming that we selected in this article since they have a minor impact on connection speed and will allow you to watch online streaming content without problems. 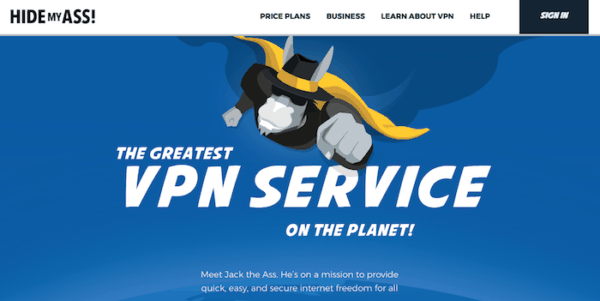 These VPN providers offer the best connection speeds and have servers all over the world. These VPNs support all devices, and some even have features that make streaming even better. This is the most sensitive reason why you must have a VPN active while watching free live streaming content online. As we explained in this article, websites that offer live sports streaming for free infringe some copyright law at a certain point. Once you access pirated contents, you are committing a crime. A VPN has the peculiarity to make your connection almost 100% anonymous. All your traffic is encrypted, and your real IP address is hidden. As a result, it is extremely difficult to track back on you. If then you choose a VPN no-logs, the VPN provider will not store any information about your online activity making you invisible. Therefore, when the VPN is active, you are protected from any legal action against you. ExpressVPN is one of the best VPN providers on the market. User-friendly, well performing and 100% reliable, ExpressVPN is a great choice for any user. Thanks to the high connection speed, an outstanding network of VPN server around the globe, and a strict no-logs policy, ExpressVPN guarantees total protection to watch live sports online for free. Based in Romania, a perfect place for online privacy seekers, CyberGhost is among the most secure VPN available. Its performances concerning speed are outstanding, and you can use it to watch HD streaming content online without problems of sort. The no-logs policy protects your privacy while the favorable Romanian laws on data protection are perfect to make your activity online invisible. HMA VPN is a veteran in the VPN industry. What users appreciate the most is the outstanding Internet speed even when the VPN is active. HMA VPN boasts one of the most extensive VPN server networks around the globe, granting you access to free live streaming websites from any country. The software is super-user-friendly and you will surely enjoy this VPN and all you can do with it. IPVanish is another well-known provider. One of the main characteristics of IPVanish is that the company own all its infrastructures. Therefore, the company doesn’t need to rely on third parties for your data protection making this VPN service highly reliable. Connection speed is never an issue with IPVanish, and you can watch HD streaming online without annoying buffering or pauses. If you go for IPVanish, you will not regret your choice. NordVPN is another top player in the VPN world. The company has its headquarter in Panama where they can better protect your privacy. In fact, NordVPN has a strict no-logs policy to make your activity online totally anonymous. Once NordVPN is activated, you can watch live sports event online for free and worry-free. Connection speed may be somewhat slower than its competitors but more than enough to enjoy sporting events in live streaming. A Web Proxy can circumvent geo-restrictions precisely like a VPN. Therefore, many users wonder why not to use one of them, maybe a free one, to access live streaming websites. The answer is straightforward and revolves around a single word: encryption. A Web Proxy does not encrypt your traffic and therefore your ISP (Internet Service Provider) or third parties can easily see what you are doing online and trackback on you. Since watching live sports streaming online for free is often an act of piracy, a Web Proxy must be avoided at any cost unless you want to get some legal notification. Good VPNs are not expensive and you can protect your connection for just a few Dollars a month. It doesn’t make any sense risking of finding yourself in court when you can easily protect yourself. Watching sports online is something that is quite common in today’s world. Paid streaming services give you access to sports and all their extra content. While free sports streaming websites do not offer that much content, they do offer the service of watching the live action for free. They will give you access to all major sports channels from all over the world for free so that you can watch your favorite sport and support your team by watching all their matches live. Just never forget to activate your VPN! Are cricfree vipbox or steam2watch available for Roku?